In 1986, New York Mets rightfielder Darryl Strawberry was at the top of the baseball world. “Straw” led the Mets to a 108-win regular season and the second World Series title in franchise history. Midseason, Strawberry won the fan vote for the 1986 All-Star Game, receiving 1,619,511 votes to clinch his third consecutive All-Star appearance. Before the All-Star Game, Strawberry was crowned the co-champion of the Home Run Derby, and in the Midsummers Classic the Mets star went 1-2 with a single off Teddy Higuera in the National League’s 3-2 loss to the Junior Circuit. Offered here is Strawberry’s 1986 All-Star Election Champion trophy presented by Major League Baseball. This award measures 18 inches tall and stands on a 4 x 7.5-inch base. 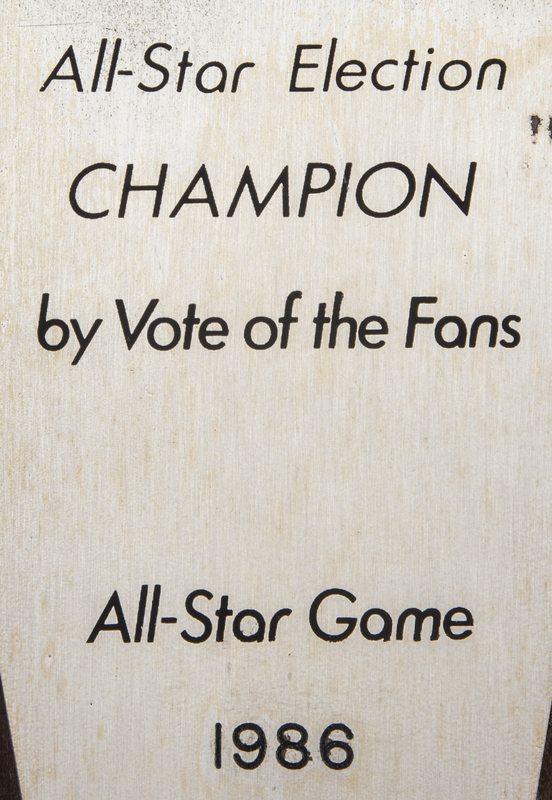 Printed on the award is the MLB logo, as well as “All-Star Election Champion by Vote of the Fans” and “All-Star Game 1986”. A placard on the bottom is printed with “Darryl Strawberry / New York Mets”. This is a great display piece from the 1986 Mets season.